Marisa Viggiano dribbles upfield. The senior midfielder provided the assist for Friday’s lone goal. There’s a saying that coach Michael Moynihan told the team on the sideline in the aftermath of Sunday’s game against Ohio State. It’s not always the team that dominates the game that comes out on top. On Thursday, Northwestern (7-2-2, 1-2-1 Big Ten) beat No. 20 Penn State (6-4, 2-1), the reigning Big Ten tournament champions, for the first time in the regular season since 1998. The No. 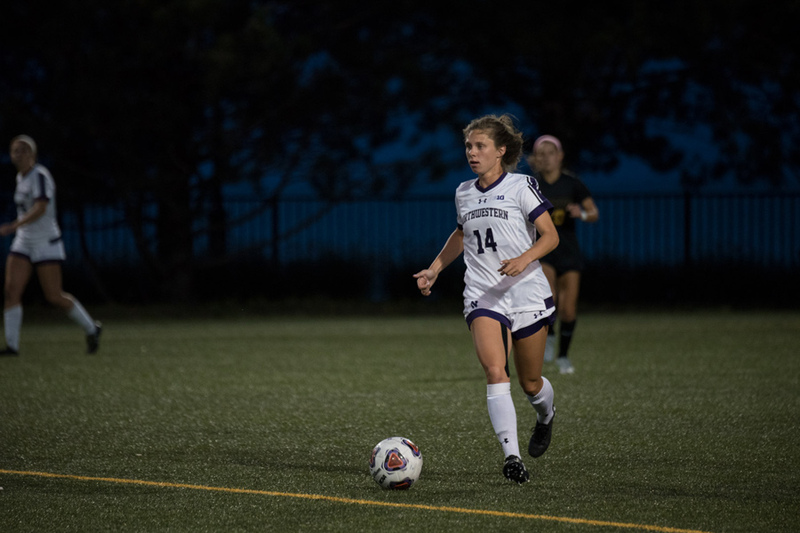 21 Wildcats were outshot 16-2 and struggled holding onto the ball, but senior defender Kayla Sharples essentially beat the buzzer with a goal at the end of the first half and they won 1-0. Two days later, coming off a season-changing win, NU’s play improved against Ohio State (5-4, 2-1), the best regular season Big Ten team in 2017. The Cats outshot the Buckeyes 9-5 in the first half and didn’t concede anything dangerous at the net throughout regulation and for the first 9 minutes and 54 seconds of the first overtime period. After a collision occurred down the field and the referee stopped play and the clock to award the Buckeyes a free kick from about 30 yards, defender Izzy Rodriguez roped a line drive that twisted over the Cats’ wall of defenders and into the bottom left corner of the net as the clock expired. In those six seconds, NU conceded its first home goal of the season and fell below .500 in conference play. Senior defender Hannah Davison said the Cats were able to execute their offensive game plan in the loss against Ohio State after not doing so Thursday. In the first 90 minutes Sunday, NU had a number of chances that could have put the game away. Eight minutes into the match, sophomore forward Nia Harris found the ball in the box off a cross from senior forward Brenna Lovera, and Harris forced Ohio State goalkeeper Devon Kerr into a diving save. In the second half, Sharples had consecutive near run-ins with crosses off corner kicks in the 75th minute that could have given the Cats the lead, and she took two more shots in the run of play. On Thursday, it only took one chance for Sharples to connect. Off a corner kick from senior midfielder Marisa Viggiano, Sharples poked the loose ball into the net for the eighth goal of her career. Penn State dominated the Cats, and NU did the Buckeyes. Yet, both times the team with the lesser game walked off the pitch victorious.